Big Island boys basketball squads were thwarted Friday in their attempts to make the state championship games. In Division I, No. 4 seed Konawaena lost its semi final match-up against No. 1 Maryknoll, 45-32. Konawaena now takes on unseeded Punahou for third place. Meanwhile, Maryknoll advances to the Division I title game against No. 2 Kalaheo. In Division II, No. 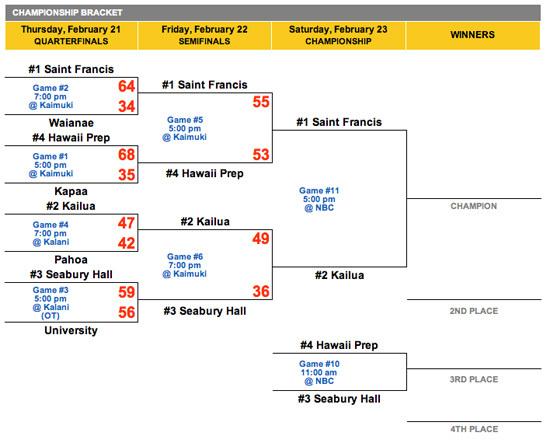 4 seed Hawaii Preparatory Academy lost a squeaker to No. 1 Saint Francis, 55-53. HPA plays No. 3 Seabury Hall for third place. Also in Division II, Pahoa plays Waianae for fifth place. The Division II title game features No. 1 Saint Francis and No. 2 Kailua. Both championship games will be broadcast beginning at 5 p.m. Saturday on OC16 (Channel 12).